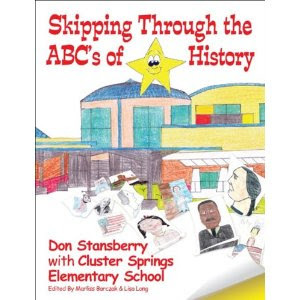 Illustrated by Cluster Springs Elementary Students and Headline Books author Don Stansberry, this is a history book like no other! Incorporating Virginia Standards of Learning [SOL's], Skipping Through the ABC s of History will not only educate, it will entertain readers of all ages! A must for the home, classroom, and every library. Don Stansberry is a native West Virginian and an elementary school teacher. He has been in the public school system since 1984 and always had an interest in writing. He was the head coach for the Parkersburg High Girls' Basketball team for 16 years and retired from this position with four state championships. Don lives in West Virginia with his wife Patty and his two daughters Shay and Sydney.